While rums are traditionally thought of in terms of their country of origin, there are some that defy simple classification. 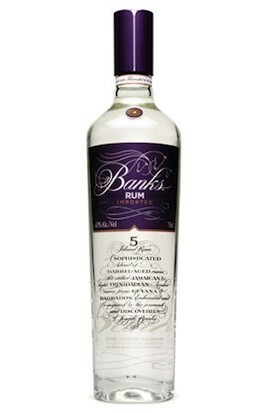 If one was going to be a little more precise, this would actually be "Banks Four Islands and Part of a Continental Landmass Rum", but that doesn't have the same ring to it. Instead of sourcing their rum from one particular part of the Caribbean, the blenders behind this rum decided to put together rums from Trinidad, Jamaica, Barbados and Guyana. Included in the blend is their "special ingredient", Batavia arrack from the island of Java. The five spirits are all aged from three to twelve years, blended together and then charcoal filtered to strip color from the spirit and produce a crystal clear white rum. Whether it's a matter of the rums they selected to go into the blend or a feature of the filtration method, this is a very crisp, dry spirit, without a lot of the caramel sweetness one usually finds in aged rums. What is there is lots of wonderful hogo, likely coming from the Jamaican rum and Batavaia arrack. What sweetness there is seems to be more of a morass of tropical fruits. While Banks makes for a delightfully complex daiquiri, it can also be used to give more complex potions a bit of zip and funk. Combine all ingredients and blend for five seconds with a small handful of ice. Pour into a glass with more crushed ice. This is a relatively light drink, with two out of the three rums providing a supporting role while the Banks provides a stiffer backbone. Mild fruitiness from the lime and orange juice is backed up by the smooth sweetness of honey and a touch of spice from the falernum. Overall a rather pleasant drink with ingredients that won't break the bank. While there are those who argue that arrack isn't properly rum, if it's not it's at least the crazy cousin who you're not sure you want to hang around at first, but who turns out to be utterly fascinating in the right situations. Batavia Arrack has a long history, proceeding the Dutch colony that gave the city of Jakarta its former name. Sugar cane from South Asia and distillation techniques from China met on the island of Java and were combined to produce the original spirit. In addition to a local variety of yeast that is used in the fermentation, a small amount of red rice is added, which contributes to the spirit's unique palette of flavors and smells. While arrack has a fairly long history in punches and cocktails, it fell out of favor and was nigh impossible to find outside of northern Europe, where it remained in limited use in chocolates and Swedish Punch. We can thank the estimable Eric Seed of Haus Alpenz for returning this unique spirit to American shores. This is a rather potent spirit at 100-proof, which combined with its face-punch of flavor means that it's not really designed for straight sipping. Some of this is due to the fact that the spirit is essentially un-aged, with only a brief period spent resting in large teak vats before bottling. While some of the usual rum characteristics can be found within, the primary flavor is pure hogo. Dancing around that core are hints of brandy or wine that I suspect come from the red rice. While arrack can be a difficult spirit to work with, it shines as an accent to other spirits and in punches. One of my favorites comes from David Wondrich's book on punches, the Ruby Punch. While originally made for a large-ish party, I've scaled it down to a single serving and tweaked one of the ingredients. Combine all ingredients, stir briefly and chill in the refrigerator or freezer until cool. There are a lot of complex flavors playing around in this drink, but magically they all manage to balance each other perfectly. The port has a fruity sweetness that provides a base for the more complex flavors of the arrack and tea, with the lemon juice providing snap and the demerara syrup rounding out the entire drink. The ABV works out to somewhere around the mid-teens which makes this a wonderful cool drink to sip outside on a summer evening without blowing yourself away. The recipe can obviously be multiplied by the number of people you'd like to serve if you want to scale up to a full-blown punch. 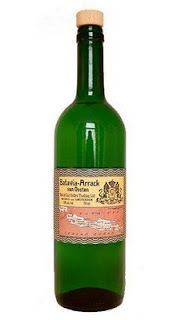 If you'd like more recipes using Batavia Arrack, Haus Alpenz has a nice list. Following the traditions of some of my betters, I wanted to look back at what I've learned in the year since I started this blog. • I am constantly amazed by the awesomeness of other cocktail, liquor and booze bloggers. Seriously, if you enjoy this stuff at all, go read through the links on the left hand column. Just about everything I know comes from reading their delightful prose. • While I started this journey with a strong appreciation for gin and tequila and a nascent interest in rum, tiki drinks have slowly encouraged me to build a love for brandy and whisk(e)y. Plus, you know, more rum. Everything has its place, even if you have to play around a bit to find it. • Making good drinks for other people is incredibly satisfying. • While I have yet to join the garnish crowd, some of them are really, really pretty. • I really enjoy making my own ingredients. Some of my own devising, others from reputable sources. • While I tend to make my own drinks at home rather than going out, there are some really excellent places in Portland for a good tipple. •Getting readers requires putting yourself out there, both through commenting on other blogs and any other available channels (thanks, Horde!). •There is politics, even in the world of cocktails. •The Northwest is full of excellent distilleries, both old and new. Overall I just wanted to thank everyone who has read this blog over the last year. Here's to many more tasty drinks and useful posts. 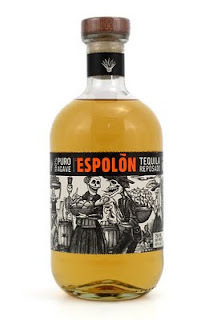 El Espólon tequila has made a fairly recent reentry to the American market, this time with some rather attractive bottle designs. 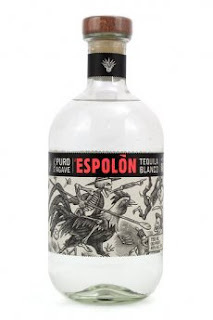 I first stumbled upon the brand while looking for a reasonably priced reposado tequila to supplement the tasty but somewhat pricey Corralejo on my shelf. Tastings.com reviewed it quite favorably and a local store had recently started stocking it. With a quite reasonable price point of $27 for both the blanco and reposado bottlings, I was pretty much sold. The younger of the two bottlings, this tequila is crystal clear. On its own or in a more delicate drink like a margarita, there is an undeniable harshness to this spirit that I find somewhat off-putting. Either because of the roasting process or the hearts cut being started a wee bit too soon, this just isn't quite as smooth as I would hope for from a spirit that markets itself in the 'premium' category, no matter how debased that adjective may be these days. Underneath that less pleasant layer, there are significant amounts of agave flavor coupled with somewhat indistinct fruit flavors. Thus, while it makes a reasonable base in drinks with other strong flavor components, I don't think that it's sufficiently refined to be the anchor in simpler drinks. Here's one example where I think it works fairly well, a margarita variation with cinnamon syrup and falernum providing a one-two punch of flavor to balance the blanco tequila's assertive nature. Combine all ingredients, shake with ice and strain into a chilled glass. This is unfortunately going to be a little tricky to make. Unwilling to pony up for Gran Marnier or Cointreau, I turned to the Homebrew Underground's Orange Kumquat liqueur recipe. After making my last batch, which would have produced more than a liter of finished liqueur, I decided to not add any sugar syrup and essentially make liqueur by adding the proper amount of simple syrup each time to make it in situ for each drink. What this also allows for is substituting in different syrups instead of regular ol' simple. So in essence I'm adding 0.5 oz of orange-kumquat-cinnamon liqueur to the drink. 0.5 oz of orange liqueur and 1 tsp each of falernum and cinnamon syrup is a decent substitution, though you'll want to add a bit more lime juice as well to balance the sweetness and overall the drink won't be quite as spicy. Combine all ingredients with a small handful of crushed ice, blend for five seconds and pour into a double old fashioned glass or similarly sized glass filled with more crushed ice. Yes, rum and tequila can play well together. There are a lot of strong flavors playing around including dark Jamaican rum (I used Coruba), which tends to have an almost burnt sugar flavor, to the tequila, which brings its distinctive vegetal agave, and the passionfruit syrup, which is an explosion of fruitiness with a sour edge. Balancing those elements are the orange liqueur (the cinnamon and clove of the orange-kumquat liqueur also slot in fantastically here) and orgeat, which somehow manage to do the job. Each part is in tension with the other, but they come together in a delectable whole. Don't believe me? You can also scale this drink down to half size, which is much more manageable and less likely to leave you sitting on the floor. To summarize, I can heartily recommend the reposado bottling. It's an excellent deal that compares favorably with the other two reposados on my shelf, which cost $5-10 more. However, I'd skip the blanco. It isn't particularly distinctive, offering nothingthat the reposado doesn't but brashness. Even more damning is the fact that unlike most other tequilas, there is little to no price premium for the reposado over the blanco. Hopefully the distillers will be able to refine the blanco and differentiate the two in future, but right now the choice is clear. A few months back, I was kvetching about the lack of high-proof gins available in the US. While that still bugs me, I decided to take a page out of Jeffery Morganthaler's book and make my own. My recipe diverged a bit from his, mostly because I was trying to make something akin to Plymouth Navy-Strength gin. There are seven listed botanicals in Plymouth and I was able to get all of them from without much trouble. For anyone in the Portland area, Limbo, off SE 39th & Holgate, is an absolutely fantastic place for getting herbs and spices. Lightly crush all solid ingredients and add to liquid. Seal and store overnight, shaking occasionally. Filter through coffee filters until sufficiently clear. For something where I was fudging a lot of the measurements, this turned out rather well. I probably could have filtered it a time or two more, largely because of the powdered orris root (I need to find it in unground form at some point), but it's no big deal. The orange and lemon tinctures were also shortcuts because I happened to have them on hand, but a couple of strips of orange and lemon peel (without any white pith) would work just about as well. This recipe used a mixture of Everclear (95% EtOH) and water, but 100-proof vodka will work too if you can't get your hands on the former. Ultimately I'd like to try making batches at different proofs to see how the flavor profile changes depending on the extraction efficiency of various flavor compounds. Much like Morganthaler's recipe, this is entirely provisional. I was aiming for a particular set of flavors, but you should feel to adjust it to your own tastes. A lot of his suggestions for additional spices to try are good and I would add cucumber to that list if you happen to like gins such as Hendricks or 12 Bridges. Also, this wasn't a particularly juniper-forward gin, so if you want more of that evergreen snap, you should add some more. In no small measure, my ultimate reason for wanting to make high-proof gins came from an article on Oh Gosh! about a gin-based tiki cocktail, the Winchester. Since it's a) hard to find and b) a bit spendy, I've yet to plonk down the cash for a bottle of Martin Miller's Westbourne Strength gin. While my own version doesn't have the visual clarity, it is certainly up to proof and then some. In trying to make my own Winchester, I had to make a few substitutions due to other missing ingredients, but the final product was pretty good. Combine all ingredients, shake with lots of cracked ice and pour unstrained into a chilled single rocks glass or tiki mug. If you haven't glanced at the original Winchester recipe yet, I'll fess up and point out that I had to sub just about every ingredient on the list, except for the juices and syrups. I also eased up on the Old Tom, both because of the higher proof of my experimental gin compared to the MMWS and because the Ransom Old Tom has an awful lot of cardamom, which can easily overpower a drink. I also don't have any St. Germain (yes, I am a terrible cocktail blogger). The Yellow Chartreuse was the most floral liqueur I had on hand, so in it went (probably bumping up the alcohol content of the drink a bit as well). Combined with the Hendricks, which is a rather floral gin, the overall flavor profile is hopefully reminiscent of, if not exactly the same as, the Oh Gosh! recipe. This is quite a powerful drink, both in terms of alcoholic strength and flavor. There was still a lot of cardamom (I might bring down the Ransom a bit more and sub in some Plymouth if I was making this again), but the ginger bite, floral and herbal flavors from the gins and liqueur still made themselves known. I actually forgot to add the Angostura bitter straight off and had to add them later, but the drink has a fairly similar flavor profile even without them. The bitter simply accent what is already present and give the drink a bit more snap. The other elements tend to play supporting, but still important roles, with the grenadine and lime balancing each other and providing a nice fruity roundness and the grapefruit adding it's own bitter character to that of the gin. It's been fun to explore the realm of non-rum-based tiki drinks and I'm hoping to get to more of it in the future. While rum will always be my main love, there's plenty of tasty drinks to be made with other base spirits.